No one could be accused of having missed the major headline that hit earlier in the year when the NHS was brought to its knees following the Wannacry ransomware attack. Cybersecurity firm F-Secure described it as ‘the biggest ransomware outbreak in history’ having affected more than 300,000 computers across 150 countries. Whilst the attack targeted other organisations including Fedex and Telefonica, the NHS was by far the biggest casualty of Wannacry with hospitals and GP surgeries across the country failing into chaos, unable to access patient records. We have in the past talked about how physical security can be used to protect sensitive data. But how can the medical and health care sector specifically be safeguarded using physical security? How to feel safe and at ease in the health care sector? Security within hospitals, surgeries and medical centres is crucial. Health care providers are entitled to feel safe and at ease whilst they carry out their vital duties, in the same way that patients must feel secure and relaxed whilst they recover from their ordeals or illnesses. Integrated, multi-layer solutions are called for in this sector: solutions that combine CCTV monitoring with sophisticated alarm systems and access control. The perils of working in the medical profession, whether as a practitioner, health care worker, practice manager or receptionist, are surprisingly significant. The threats that workers face in this sector are manifold: it can be quite a hostile environment. What’s more, there is also the added element of working with sensitive items such as confidential patient records, as well as drugs and medical equipment, which are often targeted by thieves. The highest levels of security, alongside the ability to closely control them, are vital. For patients, recovery will only be successful in a calm, relaxed environment. Security will therefore need to be subtle, yet effective. A bank of security guards and obvious security measures that come across as imposing will not be conducive to an effective healing process. The objective therefore of security solutions in the medical and health care sector has to be to ensure a safe and secure environment in which both staff and patients feel total at ease. 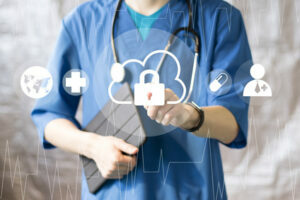 So what should a medical sector security solution comprise? The threat of unauthorised access in health care facilities and hospitals is significant. Fully integrated intruder detection systems will protect premises round the clock by providing continuous monitoring. Intruder alarms combined with motion sensors can be zoned to protect particularly sensitive areas from unauthorised access, for example drug stores and medical record archives as well as computer system servers. Alarms, in particular panic button alarms, can also be used to protect particularly susceptible areas, such as those where staff at risk from violence or working alone are based. It is vital to choose a CCTV surveillance system that is fully tailored to your specific premises, whether that’s an extensive hospital, or a small GP surgery. Systems should be bespoke designed to meet your specific threat level and particular needs. You’ll need to keep things subtle, so that patients and staff consider the cameras more something that’s helpful rather than intrusive: this takes great skill and experience. CCTV provides effective monitoring both inside and out, not just for security purposes but also for health and safety. There is a range of options, from analogue systems through to internet connected cameras that give you real time access to footage from a variety of zones using just a minimal number of cameras. Controlling who can enter your medical facility, or certain parts of it, is something that will transform your premises security. Access control is absolutely crucial in places where confidential records and dangerous medical equipment and drugs are stored. These systems make sure that only authorised personnel can enter restricted zones, either through a smart lock, fob or digital keypad. Access control can also be deployed in an emergency situation where it suddenly becomes necessary to close off certain areas of a building, or even entire premises. The systems provide a full audit trail, so you are able to see in an instant who was in what part of the building at what time. Barry Bros Security has been providing tailored security solutions to a range of industry sectors for more than six decades. Our solutions are sophisticated and multi-layered for the ultimate in protection, which for the medical sector means for patients and staff alike. If you are looking to safeguard your medical or health care facility using the latest, cutting edge security technology, why not give us a call today? Our experts are ready and waiting to help.